The following story is by Hannah J. Nikonow with the Intermountain West Joint Venture and originally published on the BLM Daily. For almost 15 years on any given spring morning at Wyoming's Rome Hill, you could hear every noise associated with daybreak in the sagebrush sea, except one: You wouldn't hear that strange burbling sound the male greater sage-grouse makes during its mating rituals. The story was the same for many years. Every March and April someone from the Bureau of Land Management (BLM) or Wyoming Game and Fish Department would visit the Rome Hill sage-grouse mating site, known as a lek, and report zero birds observed. Records indicate that the lek status was unknown with little activity since 1980 and then later deemed inactive for 15 years. Then, something changed. In 2015, BLM employees discovered 22 male sage-grouse lekking in a slightly different location from where a historical lek was documented, just a hill or two away. Birds were again documented there in 2016, and in 2017, 17 males were counted on that site. After so many years of absence, why have the birds returned? Worland Field Office BLM wildlife biologist Tim Stephens said a number of factors could explain the return of sage-grouse. The region has experienced good precipitation for the past few years, which is important for hens to successfully hatch, raise, and feed chicks. The cyclical nature of predator populations might also be in a dip, but Stephens said another factor that likely could be contributing to the sage-grouse returning is a 1,200-acre, multi-year juniper removal project. "After years of seeing no birds at this lek, I'm thrilled to see it active again and with such good numbers, particularly considering all the time and effort put into the Rome Hill conifer removal project," said Stephens. Rome Hill is pictured here before the juniper removal project. 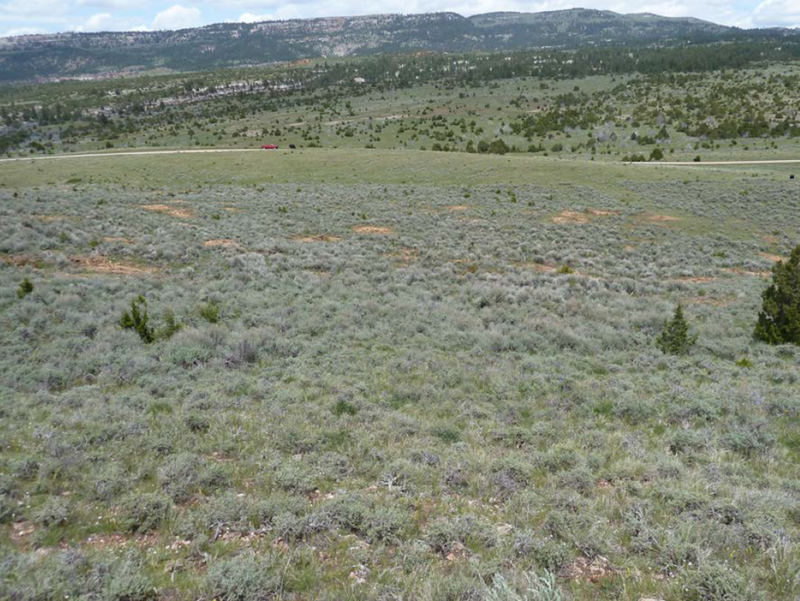 Juniper removal was a key part of restoring sagebrush near Rome Hill. Post treatment: Juniper removal is one step of sagebrush restoration projects. Juniper is aggressive at re-sprouting and the site will need maintenance to prevent it from taking over again. In areas like Rome Hill, a scattering of trees through a sagebrush-dominated landscape may seem harmless, but junipers and other conifers can outcompete other native plants for sunlight, water, and nutrients to the point where there isn't any other plant remaining. Juniper can also provide useful perches for raptors to efficiently prey on sage-grouse. Similar stories to what happened on Rome Hill after encroaching conifers were removed have been told throughout Wyoming's Big Horn Basin. A juniper removal project called the Left Hand project saw a return of sage-grouse to a lek that was inactive for more than 30 years. Mike Healy runs the LU Ranch, a livestock operation in the area and holds the grazing lease in the project area. He has seen an increase in the quantity and quality of grazing available to his cattle since the junipers were removed from the deep soil areas where sagebrush and other plants belong. "When junipers move in, they just dominate," Healy said, "but after a few years since they've been removed the native plants and, eventually, sagebrush come back in, which is a great, diverse forage-base for our livestock." A sage thrasher (Oreoscoptes montanus). 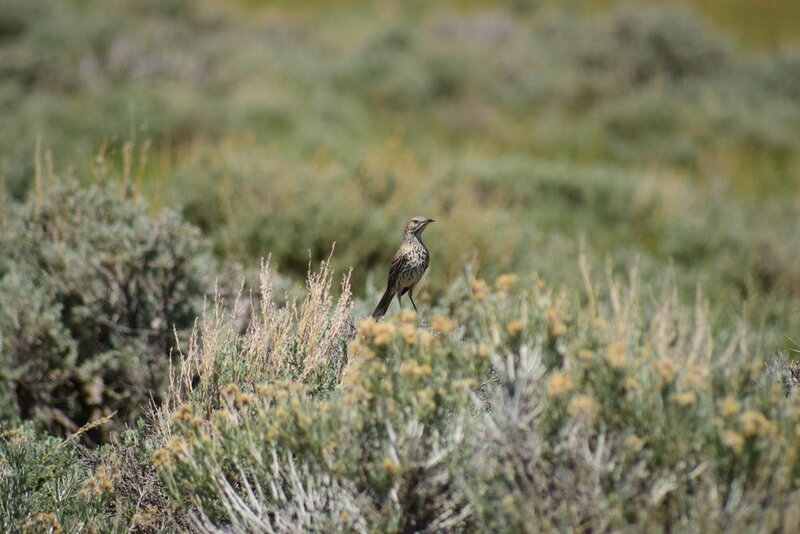 Populations of sage thrashers, another bird species that depends on healthy sagebrush-steppe, are expected to increase as the result of juniper removal near Rome Hill. This juniper removal project is in proximity to a lightning-caused wildfire that burned 12,500 acres of mostly juniper. BLM has also done prescribed burning in the area, all of which Healy said has done good things for the health of the plant community, for both cattle and wildlife. Mule deer (Odocoileus hemionus). Mule deer are one of about 350 wildlife species that depend on sagebrush-steppe habitat. The success of the Rome Hill and Left Hand projects are small examples of the many sagebrush habitat conservation efforts across Wyoming. Conifer removal is one type of project being conducted by BLM, Wyoming Game and Fish, U.S. Forest Service, The Nature Conservancy, Natural Resources Conservation Service, and private ranchers. Representatives from these organizations sit on sage-grouse working groups or collaborative teams that guide and fund various projects based on local input and needs. The initial removal of juniper is just the first step on these projects, said Rance Neighbors, BLM assistant fire management fuels officer in Worland. Juniper can re-sprout within a project area and portions of Rome Hill have been re-treated. "The maintenance phase cost-per-acre is substantially less but re-treatment will need to be completed on all projects in order for them to remain viable for wildlife," Neighbors said. "Partners will be key to making sure this post-treatment happens around the Big Horn Basin. Otherwise, the sage-grouse will abandon places like Rome Hill and Left Hand again. We can't let that happen."